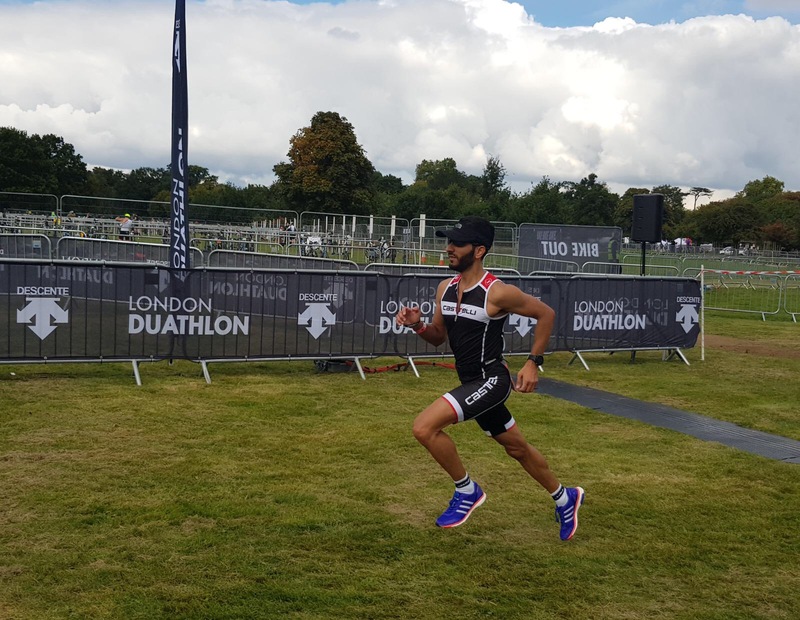 The London Duathlon has now become one of my firm favourite events, and a highlight of the year. I love running. I love cycling. Combing the two disciplines is simply an amazing experience. I managed to get a free place for this year’s event, after achieving a PB last year. It has been a very troubling few weeks for me (health-wise), and right up until race morning, I was debating on whether I should even do the event. I absolutely hate mentioning this, but it is a huge reality and affects my performance full circle. But I firmly believe that how we perform under duress is what truly defines us. Philosophy and reasoning aside, how did this year go? So due to a pretty rough morning, I was a little late leaving the house. Getting the bike into the car proved to e a little more difficult than anticipated (new car, and did not check the dimensions before!). We finally got everything packed, and Sania, myself and my Dad were all on our way just after 10am. We met some (typically expected) traffic on the A406, and some more heavy traffic in Richmond on the High Street. We finally made it at around 11:40, and were fortunate enough not to have any difficulties with finding a parking spot near Priory Lane. Phew! This is the closest place to the race village. Mark was already waiting for me. I finally made it to the race village at around 11:50, and we racked our bikes in transition together. There was already a queue forming for the start pen of our event, so we quickly funnelled in. We were doing the half-duathlon distance today, which consists of a 5k run – 22k ride – 5k run. My time from last year was 1:33:24, so it would be nice to best it again this year. I couldn’t really engage in a proper warm-up in the start-pen, so some light mobility and flexibility in a confined space was my best bet. We were waiting in the pen for a fair while, as the event organisers were giving strong priority to those wearing the official Descente cycling jersey which came with your race pack. Being grossly over-sized (and not suitable for running), I felt like we were almost being penalised for choosing not to wear this. We finally made our way to the start line at around 12:50, and were the very last wave to be released. But were finally off! Mark and I stayed together for the first 5k run. We overtook scores of runners, and viewing this on Strava flyby after the race was quite entertaining! Fortunately, there was space to overtake runners, and we did a pretty good job of this. I felt strong for the first run, and we finished it in 20:45, which still felt relaxed as we entered transition. I ran to where my bike was racked (almost forgot!). Mark told me to go on without him as he prepared himself, but I insisted we start the bike leg together. I had no doubt in my mind that he would be stronger with the cycling, and Richmond Park is his home turf(! ), but we stayed together and were soon exiting transition. T1 still took 3:08, which is pretty slow. Definitely need to work on those transition times; perhaps I could dedicate some training sessions to learning how to put my helmet on quicker! It was refreshing to be out on the bike now, and we were soon zooming around glorious Richmond Park. It started to spit down with rain, but didn’t develop into a shower which was a huge relief. It was interesting once we got to Broomfield Hill which was a 200m climb, at a 5% gradient. Nothing too sinister, but a lot of people seemed to be struggling and walking their bikes up. I like to get out of the saddle and power my way up in a mid-gear, and did exactly that (best to get it over and done with!). I checked the official segment times, and was slightly slower this year than last year. In fact, my overall ride was slightly slower by 1’50”. This is no surprise as this is my first ride on the road since Ride London in July. I have only done a handful of short Zwift sessions since, as I have been concentrating more on running. All-in-all, I did enjoy the ride and tried not to go flat-out. Mark had pushed on shortly into the ride, and I knew he would have already been on the run as I racked my bike. Initially couldn’t see his bike, and thought perhaps he must have gone for a third lap! 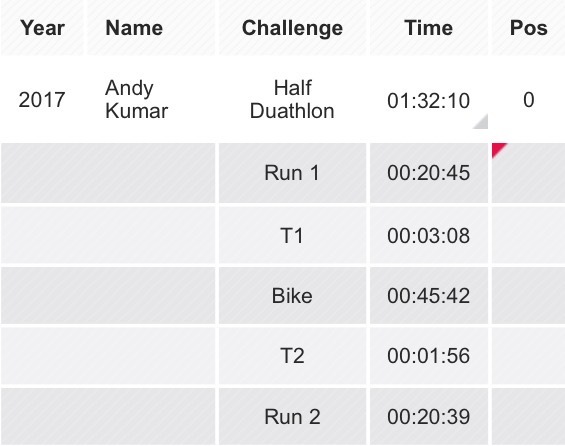 I spent 1:56 in T2, which again should have been slightly faster. I was finally in the final run, and my quads felt a little cramped, and I hoped it wouldn’t progress further. There is a slight hilly section of the run just after the 1km point. I took it easy up here, and my quads seemed to be behaving a little better, so I increased the pace slightly. My running felt more and more confident as I progressed, until I was at around 4min/km pace. At the 4km point, I was relieved to see Mark! I had a quick chat with him (and gave him a slight scare when I said I didn’t see his bike in transition!). I looked at my watch and knew I was on for a PB, as long as I could keep up the pace. I would have loved to finish with Mark, but I told him this and he urged me to push on. I knew I would be seeing him soon. I pushed on and was relieved to see the finish line as I was super hungry by now, having only had a slice of toast since morning. I tried to finish strong, but wouldn’t call it a sprint finish. Once of the Marshalls was not paying attention and just moved in my path! I nearly crashed into him just before I crossed the finish line (see the video below), which I thought was very stupid of him. But oh well. I finished, and got a new PB! I am not sure if this means yet another free place for next year, but I’ll soon find out. Sania, my dad, Shelly, Gagan and Sania’s mum were all waiting for me at the finish line. I grabbed a flat white after and we had a family picnic, which was most welcome after the event. Mark also hung around for a while, too, and it was great catching up. In all honesty, I felt very rough, but it was great to be in good company. We then headed home at around 4:30pm. 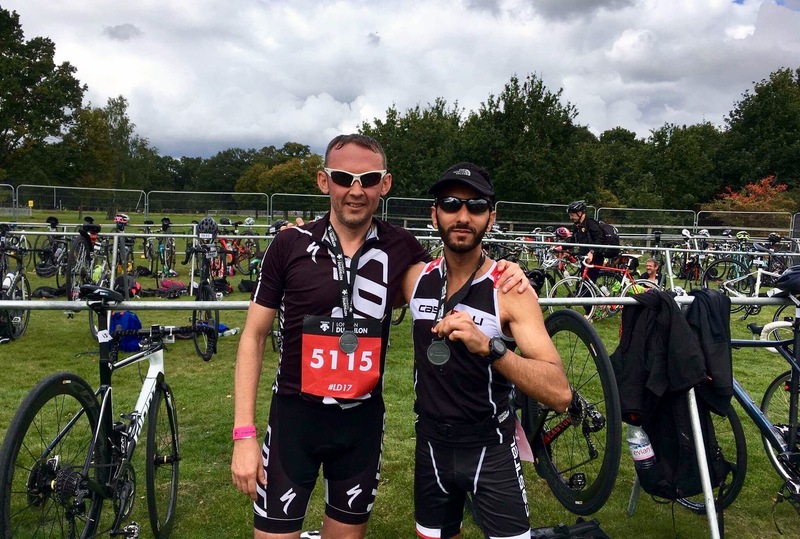 All-in-all, it took a lot of effort and willpower to get down to Richmond Park and do the Duathlon this year. I’m pleasantly surprised that I managed a slight PB despite everything, although not quite the sub 1:30 I had hoped for. Always next year! As I write this, I have Royal Parks Half next Sunday (8th October). It seems increasingly unlikely that I will be able to run it, and all current efforts are focused on entering remission from my current UC flare-up. Here is hoping something miraculous happens and I can run, though! 2017 was supposed to be a great year for running and cycling, but has truly been disappointing. I hate excuses, but in all honesty, think that I’ve given everything so far a fair punch with determination, drive and sincerity. And will continue to do so, despite the results.